Clare Evans: What a difference a year makes! SELF FUNDING the opportunity to have a career and a husband who has taken the lion’s share of caring for me for some years, has meant I have saved enough money to have savings beyond the means tested limit so have been responsible for paying for additional care myself. As I look to the future and try to make provision for future needs to be met, I have been very affected by the delay in implementing the cap on Self Funders’ payments detailed in the Care Act. The following article appeared in Community Care 19 April 2016. 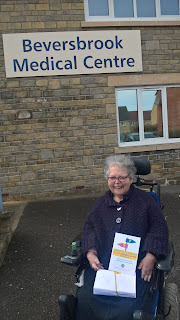 In April 2016 with the introduction of the Care Act, I was feeling fairly pleased with myself about how things had worked out for me, as a long term self funder with high support needs and my plans to cover care costs for the future. I had been using local authority home care since the 1980’s alongside my husband being my main carer. At that time even local authority home care was free for all but how things have changed! As charges were introduced, I became ineligible for local authority support because I had savings of over £23,000. So I purchased private homecare to get up in the morning. I returned to work despite the high support needs in 1993 with the assistance of Access to Work support from DWP for Personal Assistants. This made all the difference to my returning to work because they supported me by driving me, helping with inaccessible paperwork and personal care and indeed this also enabled me to earn some more funds to put towards future care! This pattern has continued happily despite increased needs with my weekday daily needs met by my team of PAs. Now I had got to the age of planning retirement and I was lucky to find in the Care Act legislation that when my Access to Work funding was likely to cease in September 2016 I would be eligible for an assessment and in the future a cap on care costs would help me for the final years. That was how things stood in April 2015, I had it all planned that I would apply for an assessment as one of the first self funders to be already assessed by April 2016 so that I knew what cost the local authority would consider eligible according to my needs. Whilst the detail of the national eligibility criteria were not known to me, I thought that needing help with getting up, being fed and help with going to the loo etc. would mean I was entitled to the cost of some regular daily provision within my capped allowance once I had spent £74,000 of my savings and the funding cap was reached. I calculated that this would be about three or four years of care support on my current needs with a main family carer and then we could relax and not have to worry too far into the future. However, somewhere along the line, in the past year, it was decided the cap and other self funder assistance in the Care Act was too costly to contemplate implementing and local authorities couldn’t cope with the workload of so many new people to assess and so plans were postponed for five years. Worse than that, the experts warned that legislation set aside for five years didn’t usually become law at all. Now the future is uncertain whilst all my savings will dwindle away. I know I am not as hard up as most people who use services and so it’s difficult to campaign about my needs but it also shows what a lottery social care funding and meeting of needs is! But on the other hand perhaps it is a relief that I have not been reduced to having my needs assessed by the local authority at present rather than doing my own planning to meet needs and choosing staff to meet them!. I might find the restrictions of eligibility criteria too constraining to deal with! I must hope I don’t outlive my savings! I’m chair of our local Centre for Independent Living where we have sought to provide information and support to other Self Funders. The number of these increases as eligibility criteria are tightened. We have recently had updated an information guide for Self funders in Wiltshire to answer the questions they are likely to ask as they do not have access to adult care social workers. We have found GP surgeries one of the most responsive places to distributing these so here I am delivering copies to a local surgery. I’m a disabled person using a powered wheelchair and VW Transporter to get about and live in rural Wiltshire with my husband and cat. I have two adult children and two grandchildren. I’ve had an interesting career, mostly in the voluntary sector, helping other disabled people speak up and give their views on services to shape them to their needs. 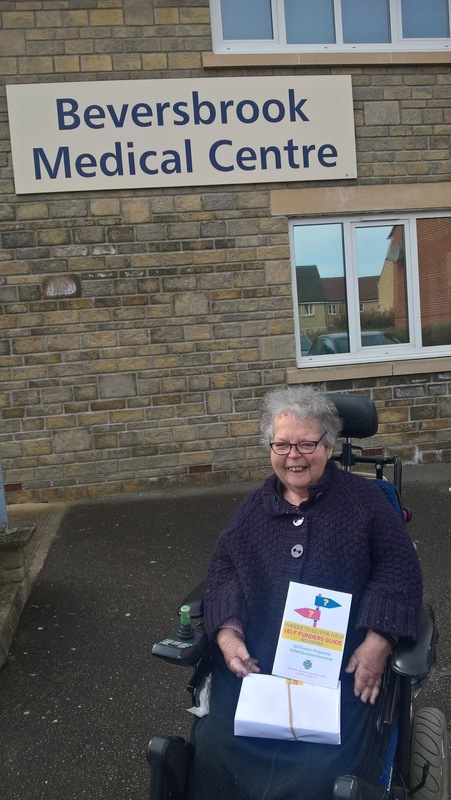 I now chair Wiltshire Centre for Independent Living which assists people purchasing their own care with direct payments and self-funders. I’m now available for one off commissions of related work and write regularly on this blog page.